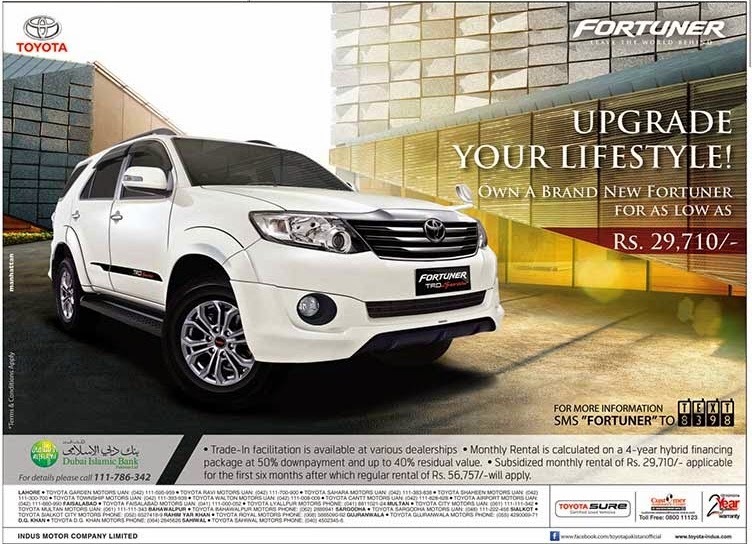 Upgrade Your Lifestyle with Fortuner And Own A Brand New Fortuner For As Low As Rs. 29,710/-. Trade-In Facilitation is available at various dealerships. Monthly Rental is calculated on a 4-year hybrid financing package at 50% down-payment and up-to 40% residual value. Subsidized monthly rental of Rs.29,710/- applicable for the first six months after which regular of Rs. 56,757/- will apply. All information are Available at Toyota-indus.com.